In past articles, we’ve delved into some amazing berries. That includes when we offered up some interesting facts about cranberry terpenes. This time around, New York City mixologist Matt Chavez showed us how goji berry terpenes can go into a cocktail recipe. Using our Goji OG terpene profile, the 2016 and 2017 Most Imaginative Bartender semi-finalist showed us just how creative he can get working with this strain. As a strain, Goji OG offers up both spicy and sweet hints that often resemble licorice and herbs. When consumed, the taste of licorice joins a fruity mix of cherries and strawberries, leaving a delicious aftertaste,to say the least. Chavez, who works for one of the Top 50 Bars in the World, according to San Pellegrino’s annual list, and other edible creatives have to work with the numerous terpenes in Goji OG’s profile. They include prominent amounts of limonene, myrcene and linalool as well as several others in lesser quantities. With a flavorful variety to work with, Chavez opted for something that would be easy to drink. For this cocktail, he settled on a smash. Chavez’s smash focuses on introducing additional berries to the mix, with additional fruit coming in the form of lemon juice. To give the drink more body, he used cane sugar. Simple syrup will work as well if you’re in a pinch. On the boozier side of the recipe, Chavez went with one of his favorites, yellow Chartreuse, for its particularly strong honey notes. Meanwhile, to create a split base, he went with fino sherry and gin. He added fino sherry for its acidity as well as its other components. “It has a touch of salinity, so it adds a little bit of that saltiness split with gin which has strong herbal quality.” To bring the drink together, Chavez muddles the ingredients in a large rocks glass before topping with crushed ice before straining the cocktail over it. He then garnishes the Gojo OG terpene on top as well as in the cocktail itself. After working with Goji OG, Matt Chavez is a firm believer in its ability to be a crowd pleaser. It’ll have mouths watering once people get a whiff. If you’d like to make your own Goji OG inspired smash, follow Matt Chavez’s creation down below. Pick up your Goji OG from us while everything else can be bought at your local stores. 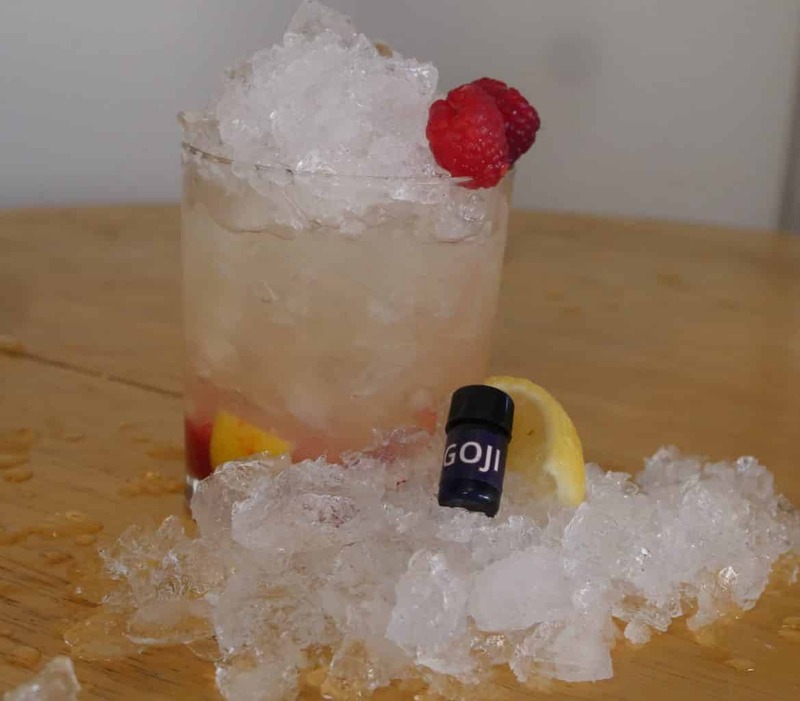 Garnish with fresh raspberries and 2 extra drops of terpene.